You are currently browsing the archives for the Superior Promos Twitter category. 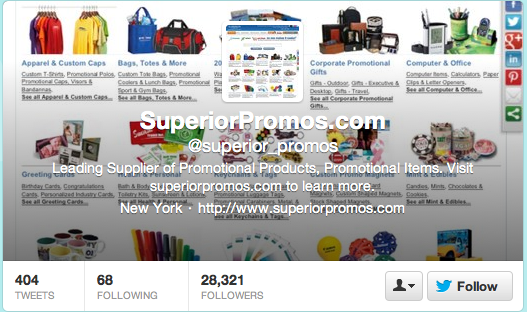 Don’t Forget to Follow Superior Promos on Twitter for Promotional Products! Yes, we’ve joined the Twitter revolution. Follow us now: http://twitter.com/Superior_Promos. We’ll be tweeting exclusive specials and discounts on all our promotional products and promotional items. Tweet to @superior_promos and let us know what specials or ideas you’d like to see. Find us on Twitter at http://www.twitter.com/superior_promos and share with us some specials you’d like to see! That’s right, we’re on Twitter. Follow us for latest specials, discounts and product announcements at http://twitter.com/Superior_Promos. 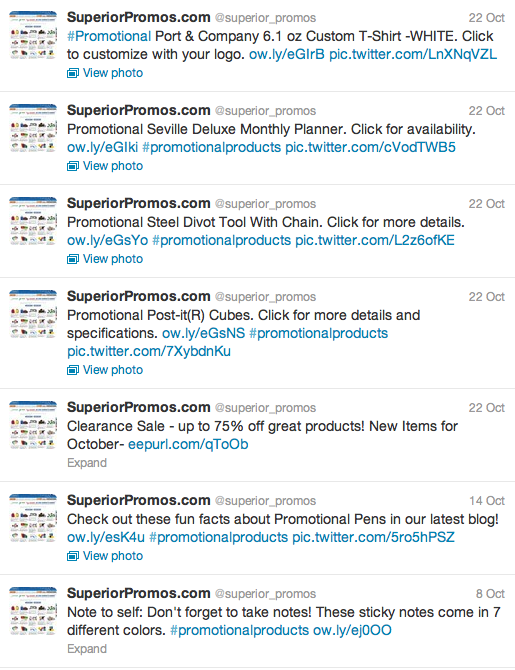 Tweet to @superior_promos and let us know what promotional product specials or ideas you’d like to see. Follow Superior Promos on Twitter! From time to time, we’ll be tweeting our latest specials and discounts. Tweet to @superior_promos and let us know what specials or ideas you’d like to see.